Elon Musk’s distaste for the mainstream media is not exactly a secret. Time and again he has complained about receiving unfair criticism from reporters, who, according to him, are often more interested about the business of news than about the truth. On Wednesday, he went a step further than he had ever gone before, calling the media ‘holier-than-thou hypocrites’, and accused it of sugar-coating lies to pass them off as real news. Musk also said that to counter the prevalence of fake news in the media, he was planning to create a website called ‘Pravda’ where people will be able to vote on the veracity of any article and track the trust rating of every journalist, editor and publication. Pravda, in case you’re wondering, is Russian for ‘truth’, and references a Russian publication that is run by the country’s Communist Party. The newspaper served as the official mouthpiece for the USSR until 1991. There’s also a website called Pravda Report, which is separate from the Communist Party mouthpiece, but has often been accused of peddling conspiracy theories rather than hard news. 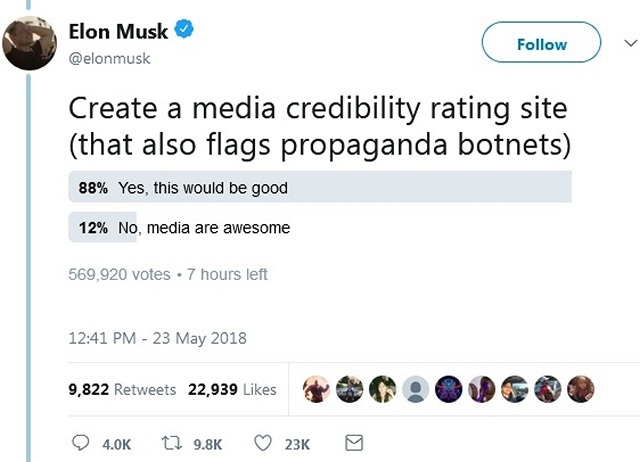 Meanwhile, as part of his Twitter rant yesterday, Musk also instituted a poll, asking the Twitterati about whether they support his plans of creating a media credibility site that, he said, would also ‘flag propaganda botnets’. At the time of writing this article, the poll had well in excess of half a million votes, with an overwhelming majority of voters – as many as 88 percent – seemingly wanting Musk to follow through on his promise. As it turns out, Musk may not be kidding about his plans to start an ‘alternative Snopes or FactCheck’ of sorts, given that one of Musk’s agents had reportedly incorporated a ‘Pravda Corp.’ in the US state of California last October. Whether that leads to anything concrete remains to be seen, but it is certainly a development worth keeping an eye out for. As expected though, Musk has also had to face severe criticism from many for his anti-media diatribe, who feel that his tirade is adding more fuel to far-right conspiracy theorists whose all-out war against the mainstream media has already started to gain traction among mainstream consumers. The Verge’s Senior Transportation Editor, Andy Hawkins (@andyjayhawk), in fact, called Musk a ‘media-baiting Trump figure’ who is ‘screaming irrationally about fake news’. On his part, Musk has had to face severe criticism from the media in recent times for a number of different problems, including a fatal Tesla crash that killed a young Apple engineer. The company has also had to face media scrutiny after allegations of exposing employees to potentially dangerous working conditions. Musk also got himself in a spot of bother at Tesla’s Q1 earnings call, where his behavior was described as ‘bizarre’, ‘wacky’ and ‘dumbfounding’ by several news outlets after he cut off reporters and Wall Street analysts, and dubbed their questions on the Model 3 as ‘boring’. He kept up his tirade the next day on Twitter, firing off a bunch of retaliatory tweets, calling those questions ‘dry’, ‘absurd’ and ‘boneheaded’, as a way of justifying his boorish behavior.